A: “Steely” Steel Post Pinlock. Pinlock steel post insulator features heavy reinforced design, integrated flash/drip guard and heavy locking pin. B: "Woody". Wood Post Pinlock Wood post pinlock, features large robust design, rear flashing plate, 20mm post clearance and heavy locking pin. A: Snap-on Rod Insulator. Fits 10mm post. 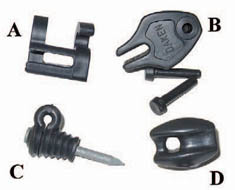 A: Pigtail Insulator – Fits 10mm post. 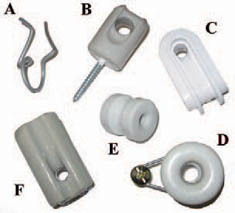 B: Plastic Bullnose Insulator – Light Strain. C: Steel Post Cap Insulator – Fits steel posts. D: Ring Insulator – Fits wood posts. E: Wedgelock Wood Post Insulator – Suits 40mm Hot Tape. F: Wedgelock Steel Post Insulator – Suits 40mm Hot Tape. 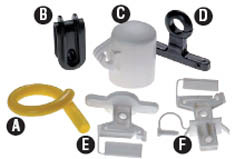 A: Small Reel – "Easy-Fit" Clip. C: Hi-Strain Bullnose– Handles heavy strain. D: Large Porcelain Reel – (41mm) with Nut and Bolt Clip to Suit 41mm Reel. E: Small Porcelain Reel– (25mm). F: Porcelain Bullnose– Handles heavy strain. These 12” standoff wires can be added to an existing fence. The balanced foot design fits plain, barbed and ring-lock type fences. The design can hold 41mm porcelain reel insulator or pinlock steel post insulator for greater versatility. A: 12" Standoff wire c/w Pinlick Insulator. B: 12" Standoff with porcelain reel insulator. This exciting new product is designed to mount onto star posts. Heavy duty construction is capable of holding wire and Hot Tape up to 40mm, and will stand your live wire 225mm from the post.